Does anyone know when the 16 re-route is going through? Last I heard from this blog, it was happening this month, but I haven’t seen anything from Metro apart from the post on this site a few weeks ago. It’s not in the rider alert. The rider alert only says the 42 is gone, the DSTT routes will be on different streets when the tunnel is closed, the 216 won’t stop at the Eastgate freeway station, 8 routes have an additional trip or slight schedule/location changes, 7 ST routes have minor changes, the Westlake kiosk is open fewer days, and the Century Square station entrance closes at 8pm through June 7th. I think the 60 has already seen some re-routes – I think I’ve seen it on Jefferson turning onto 12th, the opposite of what the map indicates. 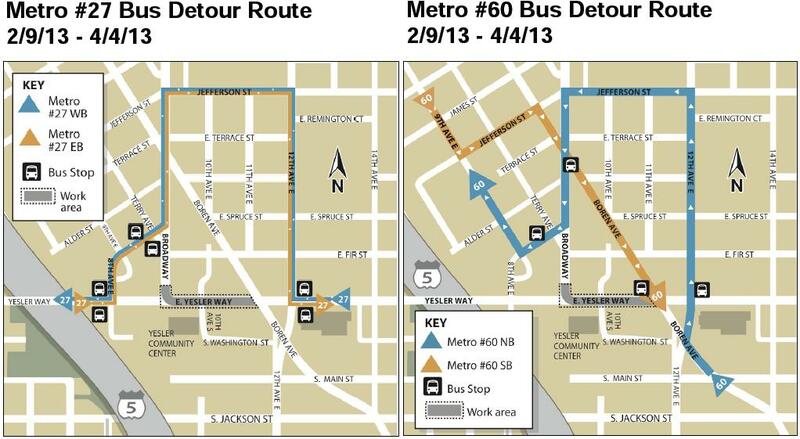 Any reason for the two different detours and the directions they use? currently, the 60 is using 8th ave to reach Yesler Way as the bus cannot turn off of Broadway due to streetcar construction (See: http://www.flickr.com/photos/gordonwerner/8453922109/in/pool-seatrans/ ) as for the difference between the NB and SB routes … they are trying to maintain service to the stops in Yesler Terrace and the shown route is the only path the bus can take (other streets on the map are not wide enough for buses + parked cars or they are one-way in the wrong direction or they are not actually thru-streets. The northbound zig-zag on #60 is likely to avoid a rush-hour left turn onto Jefferson, and the general northbound Boren delays associated with the I-5 traffic turning onto James. Why can’t the 60 just take Boren all the way to Jefferson? This avoids the work area and looks a lot more direct than the proposed route. I would guess because Metro feels it needs to stop in Yesler Terrace. Even so, the stop at Boren and Alder could be retained. The only stop that would be missed is within a block and a half of this stop, with an elevation difference of a measly 10 feet. Even if half the bus is getting on or off at this one stop (which I highly doubt), delaying everybody else a full 5-10 minutes to save such a trivial amount of walking distance for one stop does not make sense. Also, in the southbound direction, the delays won’t just affect the people on the bus at this time – everybody who will board the #60 bus later along the route will be delayed too – they will just spend the delay time standing at the bus stop, rather than actually on the bus. The southbound route is pretty direct. It’s the northbound route that’s the issue. Not sure why one is different from the other. Because you can’t make that left turn in a reasonable amount of time at rush hour. It’s legal, but not practical. The left northbound lane of Boren is a stopped queue of I-5 traffic all the way back to Broadway, and once you get to the Jefferson intersection, you’ll only be able to make the left turn by sitting in the intersection on yellow and running the red. The convoluted zig-zag is faster. [sigh] So, because the convoluted zig-zag is faster during rush hour, we have to do it all the other times of day too, even if it’s much slower outside of rush hour. This reminds me a lot of Montlake just north of Husky Stadium. Because traffic is sometimes bad on Montlake during rush hour, Metro has decided no bus can ever run on Montlake at any time of day. So the result is that Wedgewood->Montlake is a 10 minute drive, but a 30+ minute bus ride (including a fair bit of walking at the end). So your choice between a consistent slight delay, and a periodic severe delay, is the occasional severe delay. One-way streets make for really illegible bus routes, don’t they? The 2nd/4th couplet and the 4th/5th couplet have worked pretty well. You just have to have the schedule to see where to get picked up in the afternoon. The 60 has another couplet on Corson and Carleton. Again, you just need to look at the schedule. But, yeah, this is the wierdest couplet I’ve ever seen on a Metro route. One-way P&R lots are a PITA! Just love pulling in on a 255 behind a 249 at S. Kirk. P&R and trying to guess which direction it’s going. Hint, routes through S. Kirk or other piss ant poorly thought out transit centers just need separate route numbers. FWIW, the 2nd/4th couplet DT with the DSTT and surface “almost a mall.. sort of, kind of, well not really” makes sense. A P&R “couplet” at S. Kirkland would be a huge improvement. It completely boggles my mind that somebody could design a system where a northbound bus can get delayed because it’s stuck behind a southbound bus loading a wheelchair. Crazy! I also wonder how many people over the years have accidentally boarded the bus going the wrong direction. In the evenings, a mistake like that can easily set you back a full hour. It’s still one-way, but it should be able to separate the buses going in different directions. It might be nice to have another bay southbound on 108th NE so some buses didn’t need to go into the loop, but is there a flat spot there? 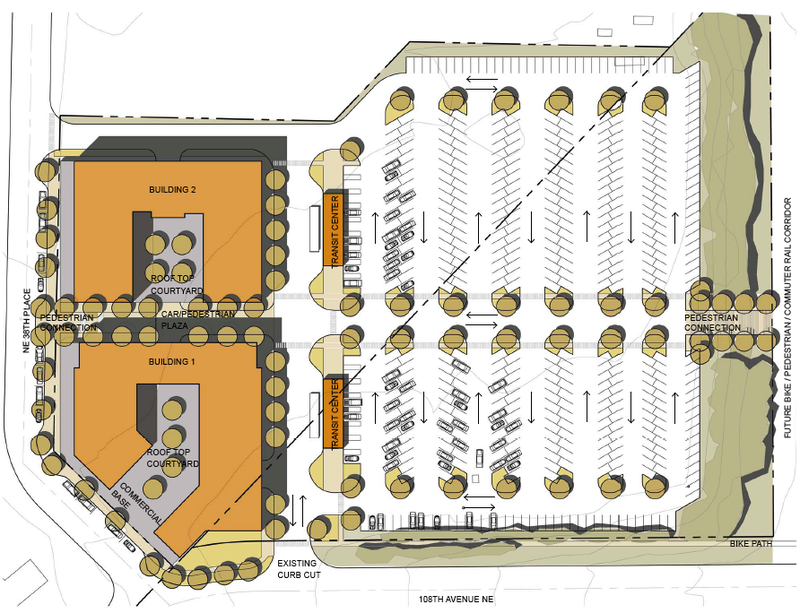 Alternatively, they could add a bay to the south side of the access road next to building 2. There’s a stop southbound on 108th NE just down hill from the old entrance. I think only the 255 is listed on the sign but I could be wrong about that. And no it isn’t on a flat spot. I’ve never seen anyone use that stop. Hopefully it’ll go away for good. I guess the only thing it’s good for is that if you realize you’ve gotten on SB bus and realize it’s the wrong way you can bail out quickly! The similar 249 stop on NE 38th Pl has saved me a couple of times :-/ It would be terrible to have a route or routes not use the regular bays since lot’s of times you can hop a different bus to accomplish the same thing. For example if I know I’ve just missed a 255 NB I can take a 234 instead and the extra 5 min. walk at my destination is faster than standing around waiting for the next 255. With proper design, buses should never need to even leave the street. Add a crosswalk so that people can easily travel between northbound buses and the parking lot and regular street stops are good enough. All the detour through the bus loop does is provide an incentive for people who live further up the route to drive to the P&R, rather than catch the same bus down by their house. If we care about faster service, we need buses to stay on the street. So asdf, that would be like the Redmond or Kirkland Transit Centers? Of course, the buses may need to meander all over the place to get to the transit center. I won’t comment on Redmond Transit Center because I haven’t been there. But my experience has been that buses can serve Kirkland Transit Center while mostly traveling in a straight line. I grew up near a transit center that illustrated transit centers at their worst. The transit center emptied out onto a busy street right before a traffic light with 3+ minute cycles. Needless to say, the buses had zero priority whatsoever coming out of the transit center. If the light was red, cars waiting for the light would block the path and the bus would be stuck. If the light was green, the bus would have to wait for all the cars going through. The bus always eventually made it through, but it would sometimes take 2-3 cycles for it to happen – enough of a random day to make buses tightly bunched the entire rest of the route. And if that doesn’t get any worse, there’s one route which is supposed to make a right turn at the stoplight right after the transit center, except the transit center is in the median, leaving the bus in the left lane. This bus has to do a straight/U-turn/left-turn maneuver in order to make it’s right turn in traffic, which adds an additional 3-5 minutes to the trip. All of which would be avoided had they not even built the transit center and just had regular bus stops along the street. Streetcar lines benefit from having a 1:1 scale map on the ground.